As a former professor and Associate Dean in the Faculty of Engineering and Design, Dr. Gunther Bauer’s philosophy on giving back is simple: “If we can, we should”. Beyond his academic contributions, Dr. Bauer’s dedicated philanthropic efforts on campus will provide generations of Carleton engineering students with opportunities to create, invent, and pursue new heights of research with real-world applications. Within the past year, Dr. Bauer has invested $50,000 to establish two endowed scholarships for students pursuing Civil and Environmental Engineering at Carleton. While the creation of the first of these scholarships honours his life-long passion for Civil Engineering, the second is aligned with his vision for a world of Engineering that embraces and recognizes talent in all its forms – and genders. Now retired, Dr. Bauer recounts the incredible resilience shown by women in Science, Technology, Engineering and Math (STEM) fields following the 1989 École Polytechnique massacre in which 14 women, many of whom were engineering students, lost their lives in an act of gender-based violence. Inspired, too, by his wife Irmgard and three daughters — three Carleton alumnae themselves — Dr. Bauer’s latest investment on campus is an endowed entrance scholarship to help eliminate barriers faced by women entering the field. 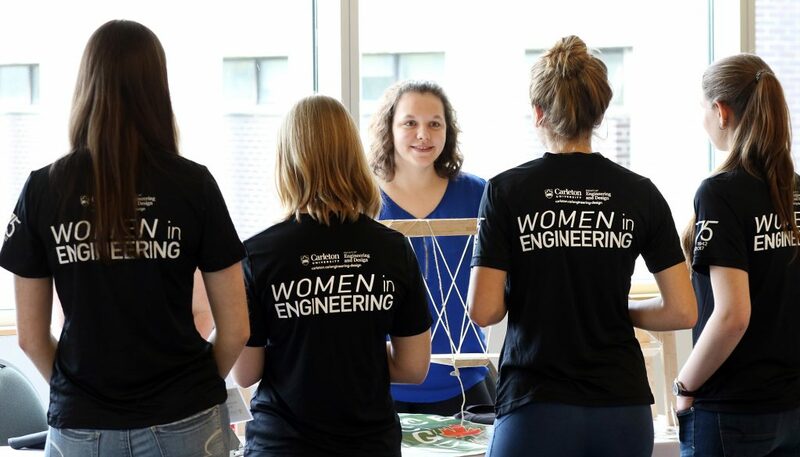 Through the support of donors like Dr. Bauer, successful alumni and many others, Carleton’s work to encourage women in STEM continues to be a powerful collaborative effort.